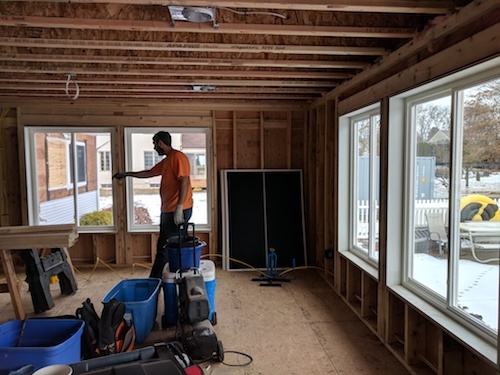 When the family of a paralyzed teen needed help making their home more accessible, members of New Haven, Conn., Local 90 jumped into action to donate their time and skills. New Haven, Conn., Local 90 members embraced IBEW's RENEW/Next-Gen initiative to help a local teen who was paralyzed following an ATV crash. Last summer, Ryan Catlin of Southington, Conn., was on vacation with his family in Maine when the all-terrain vehicle he was riding flipped and threw him. The crash damaged the 15-year-old’s spinal cord, leaving him paralyzed from his chest down. Word of Catlin’s crash quickly spread throughout his community, and Local 90 was among several Southington organizations and businesses that rallied to support his family, donating materials and services to help refit their house to better accommodate the injured young man’s special mobility needs. Some of the planned changes to the Catlins’ home ran from the routine to the ambitious — from new paint and basic heating upgrades to the installation of a private bathroom and an elevator. A handful of Local 90 members donated their time, performing services such as rough-ins and other wiring work to support the overall project. They juggled their schedules, priorities and family commitments to get the job done quickly and efficiently. The Catlin project, Woytowich said, fits with the local’s effort to boost young members’ participation in IBEW’s Reach Out and Engage Next-gen Electrical Workers initiative. New Haven, Conn., Local 90 member Don Schneider helps wire an addition to the home of a paralyzed local teen. "Our business manager, Sean Daly, asked me to look to do something with RENEW," Woytowich said. "This is just the latest one of our projects. We have more planned, but we're taking them one at a time." The mission of the union-wide RENEW/Next-Gen effort is to inspire the next generation of IBEW workers to become active in their locals. It was established by IBEW’s 38th International Convention in 2011. “Projects like this one are a positive way to get our younger members involved the union,” Woytowich said. Local 90 apprentice Brendan Smiles told the Meriden, Conn., Record-Journal that IBEW members’ work on the Catlin home reflects the union’s desire to find ways to help out in the communities where members live and work. “We’ve been in the community for a long time and we just want to start giving back,” he said. Described as a star student who had been physically active up until last summer’s accident, Catlin has been slowly regaining some arm movement, the Record-Journal reported, and he has been taking high school classes online. International President Lonnie Stephenson said that RENEW/Next-Gen is part of a broader effort to invest in the future of union and the larger labor movement.